Signup now at https://acutecoin.io and get ready to Contribute to our Pre-ICO. Receive exclusive discount when 1,000,000 coins go on Sale! A platform which provides the subscriber the opportunity to earn AcuteCoin generated via 3 main avenues in crypto currency, its hard coded proof of stake mechanism, external physical mining of crypto currencies and the building of a solid portfolio of crypto assets while supporting proven projects in the space. 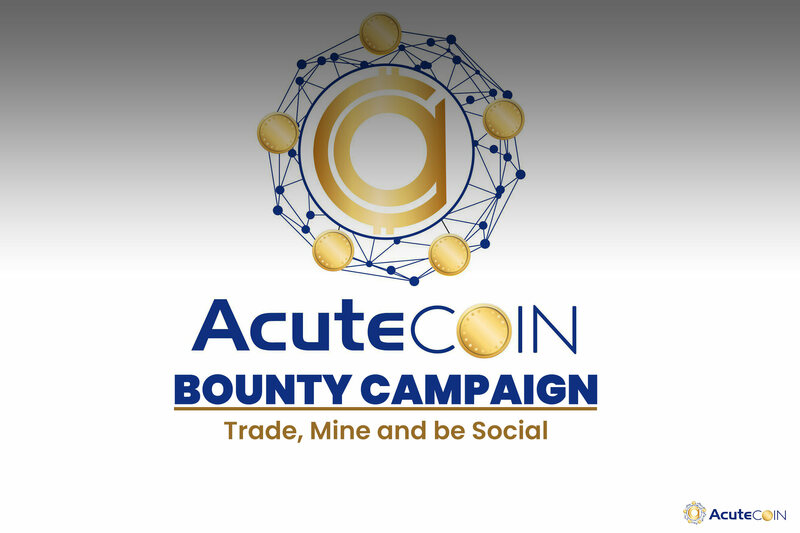 For contact, reach us on telegram: https://t.me/acutecoinbounty Raports post them on this thread with quote of the previous week -- weekly reporting - by the dates set in the spreadsheet -- but raports are welcome any time during the week. 10.000 coins have been reserved for our global bounty program. Tweet and retweet up to 5 posts a week and report them on this thread with quote of the past week.We would appreciate 1 original post with a link to our website. Follower counts will be taken at the beginning of the campaign and the initial count will be used until the campaign ends, audit score minimum 80%. Follow AcuteCoin hare up to 5 posts a week and report them on this thread with quote of the past week. We would appreciate 1 original post with a link to our website. Your Facebook friend count and shared posts must be public for verification by the AcuteCoin team. 1. Describe AcuteCoin and its featured. 2. Video must be in good resolution. 3. Video length must be minimum 60 seconds. 4. You can upload them to Youtube and other sites. 5. Three videos is a maximum per person. Moderation/Thread management: 5 points per constructive moderator post.